Ubiquitously expressed, with slightly higher expression in brain, prostate and testis. Reduced expression was found in placenta. Present in germ cells of testis and in the midpiece of sperm tails (at protein level). 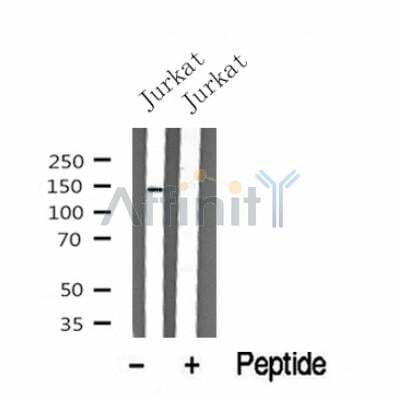 Small volumes of anti-PASK antibody vial(s) may occasionally become entrapped in the seal of the product vial during shipment and storage. If necessary, briefly centrifuge the vial on a tabletop centrifuge to dislodge any liquid in the container`s cap. Certain products may require to ship with dry ice and additional dry ice fee may apply. Function: Serine/threonine-protein kinase involved in energy homeostasis and protein translation. Phosphorylates EEF1A1, GYS1, PDX1 and RPS6. Probably plays a role under changing environmental conditions (oxygen, glucose, nutrition), rather than under standard conditions. Acts as a sensor involved in energy homeostasis: regulates glycogen synthase synthesis by mediating phosphorylation of GYS1, leading to GYS1 inactivation. May be involved in glucose-stimulated insulin production in pancreas and regulation of glucagon secretion by glucose in alpha cells; however such data require additional evidences. May play a role in regulation of protein translation by phosphorylating EEF1A1, leading to increase translation efficiency. May also participate to respiratory regulation. Post-translational Modifications: Autophosphorylated on Thr-1161 and Thr-1165. Autophosphorylation is activated by phospholipids. Similarity: The protein kinase domain mediates binding to phosphatidylinositol. Belongs to the protein kinase superfamily. CAMK Ser/Thr protein kinase family. Western blot analysis of PASK in lysates of Jurkat , using PASK Antibody(MBS9603200). NCBI/Uniprot data below describe general gene information for PASK. It may not necessarily be applicable to this product. Serine/threonine-protein kinase involved in energy homeostasis and protein translation. Phosphorylates EEF1A1, GYS1, PDX1 and RPS6. Probably plays a role under changing environmental conditions (oxygen, glucose, nutrition), rather than under standard conditions. Acts as a sensor involved in energy homeostasis: regulates glycogen synthase synthesis by mediating phosphorylation of GYS1, leading to GYS1 inactivation. May be involved in glucose-stimulated insulin production in pancreas and regulation of glucagon secretion by glucose in alpha cells; however such data require additional evidences. May play a role in regulation of protein translation by phosphorylating EEF1A1, leading to increase translation efficiency. May also participate to respiratory regulation. 1. PASK phosphorylates and inactivates GSK3beta, thereby preventing PDX-1 serine phosphorylation and alleviating GSK3beta-mediated PDX-1 protein degradation in pancreatic beta-cells.